‘Multiply, Identify, Her’ at the International Center of Photography | The Bottom Line "The Drawing Center"
Multiply, Identify, Her, on view at the International Center of Photography through September 2nd, is a brief but incisive look into current art practices that address identity, representation, and gender. Featuring work by Geta Brătescu, Stephanie Dinkins, Christina Fernandez, Barbara Hammer, Roni Horn, Wangechi Mutu, Gina Osterloh, Sondra Perry, Lorna Simpson, and Mickalene Thomas, this intergenerational group of female-identified artists offers a powerful provocation into postmodern feminism and its relation to contemporary social contexts. Working in video, film, photography, and collage, each artist exhibits a single artwork or series that investigates identity, representation, and its connections with contemporary issues around technology, race, and personhood. Beginning with postmodern feminist art made in the 1990s, the exhibition focuses on identity and representation as something that is endlessly multi-sided, multitemporal, and manifold. Resisting patriarchal representations of women as essential feminine beings, these ten artists fragment female identities as non-singular through mirroring, reflecting, transfiguring, replicating, and amalgamating forms in their work. 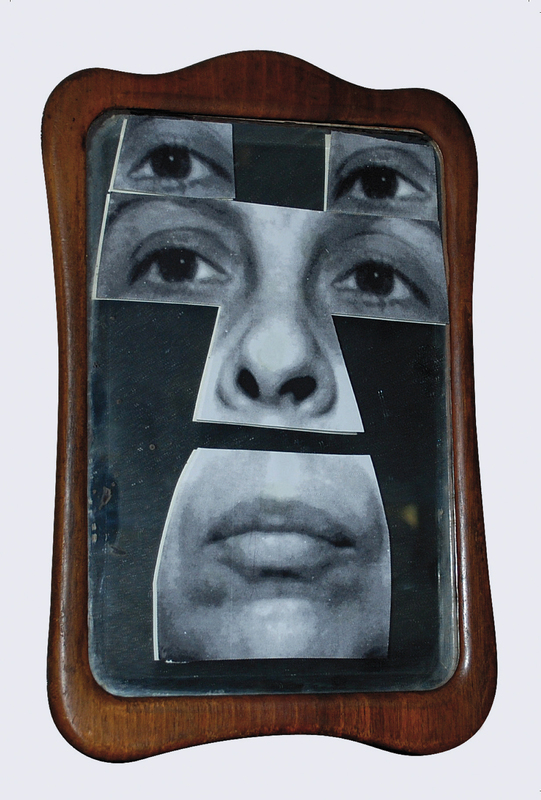 In Autoportret în oglindă [Self-Portrait in the Mirror], for example, Geta Brătescu cuts out parts of her photographic portrait and collages them onto a mirror. She gives herself two sets of eyes, doubling her gaze, and uses whole but incomplete areas of her face to create a partial portrait that is complete only with the presence of a viewer. The reflection of the viewer in the mirror, along with parts of Brătescu’s photograph creates a pastiche portrait of viewer/artist that changes with each passing face. Geta Brătescu, Autoportret în oglindă [Self-Portrait in the Mirror], 2001. Mirror, wood, gelatin silver prints, 8 1/4 x 5 7/8″ (21 x 15 cm). © Geta Brătescu, Courtesy the artist; Ivan Gallery, Bucharest; Hauser & Wirth. Photo: Ștefan Sava. While Brătescu deftly subverts the objectification of women in art historical portraits, Mickalene Thomas points to the painful lack of representation of black women. 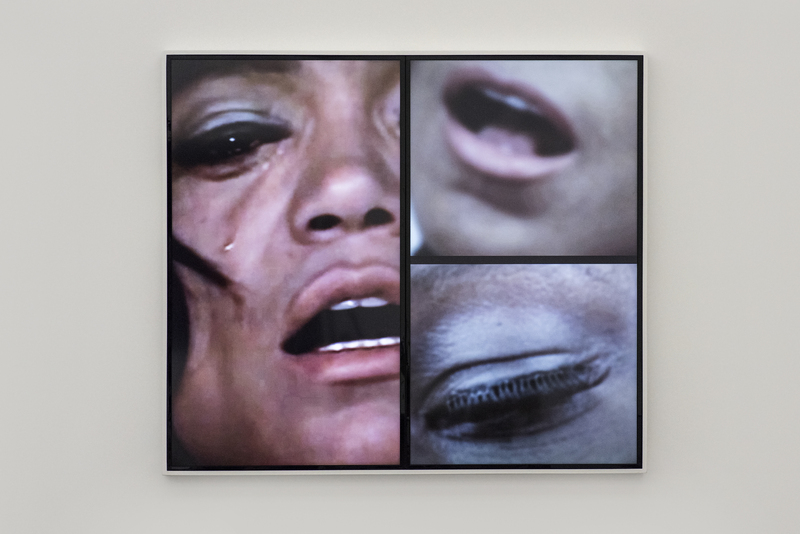 In Thomas’ video installation, entitled Angelitos Negros, Eartha Kitt’s song by the same name plays while four screens featuring Kitt and three other women of color, including Thomas herself, change intermittently. Kitt’s voice laments the absence of black female representation while Thomas’ video footage of the singer, Thomas herself, and Thomas’s partner, made more than fifty years after Kitt’s song, mourns the same issue. The women featured in the installation mirror each other’s movements and facial expressions; each person is distinct but express the same emotional outcry. The split screens, and the similitude between each women’s gestures, results in a unique group portrait that expresses their shared experience. Mickalene Thomas, Angelitos Negros (detail), 2016. Eight-channel video, sound, 23:18 min. © Mickalene Thomas, Courtesy the artist and Artists Rights Society (ARS), New York. Thomas’s recognition of the damaging shortage of black female representation gains even more weight when considered in relation with future artificial intelligence technologies. 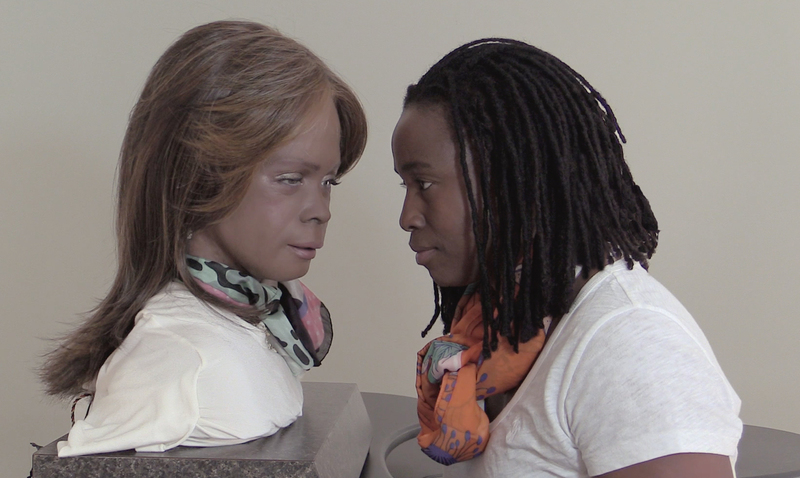 Stephanie Dinkins, in her Conversations with Bina48, a quad-screened video work, documents the artist as she asks pointed questions to one of the world’s most advanced human-mimicking androids. Dinkins embarks on a meaningful conversation with Bina48 that covers topics of gender, race, and personhood. Their unsettling and profound interactions demonstrate how societal histories intersect with technology and the biases that these models inherit from their makers. If these androids seek to replicate consciousness then representatives from communities of color must be involved in these developments in order to incorporate a more total understanding of human experience. The diversity of the selected artists enriches the exhibition’s exploration of female representation and identity by extending postmodern feminist efforts into contemporary discussions about race and technology. The group show offers an expanded proliferation of the ways in which women are seen and unseen, and underlines the importance of such discussions as technology moves ever forward to new representations of human consciousness. Stephanie Dinkins, Conversations with Bina48, 2014−ongoing. Video, sound, durations vary. © Stephanie Dinkins, Courtesy the artist.